Chester County Food Bank stores and distributes food to more than 30 area food cupboards and 60 other meal sites and agencies at no charge. 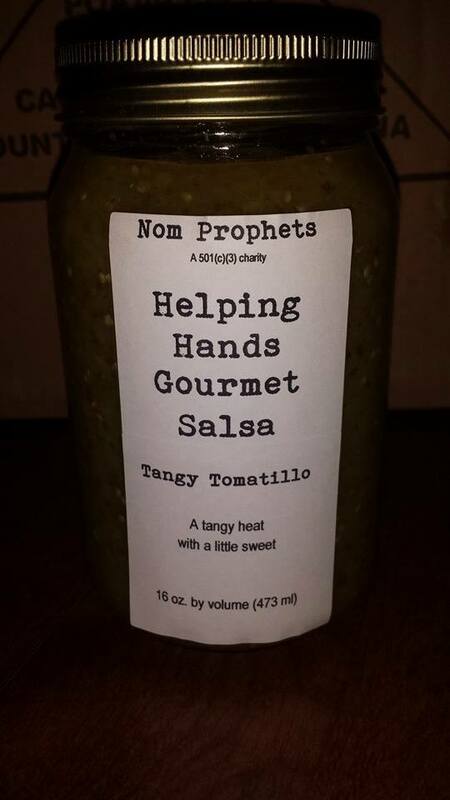 Since its inception in 2009, it has provided the equivalent of 1.7 million meals. In addition to raising money for the food bank, HFA provides sweat equity. Earlier this year, staff members worked in the kitchen at its Exton headquarters and at Charlestown Farm in Phoenixville. 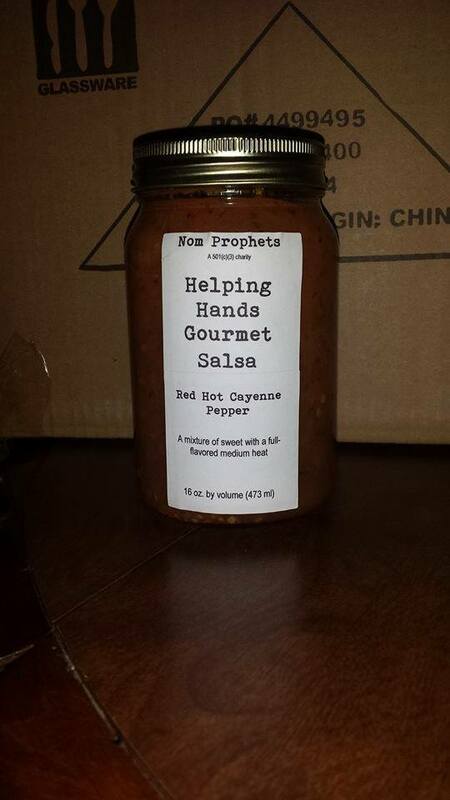 Last year HFA packed produce boxes and in past years, it pulled weeds and filled backpacks. 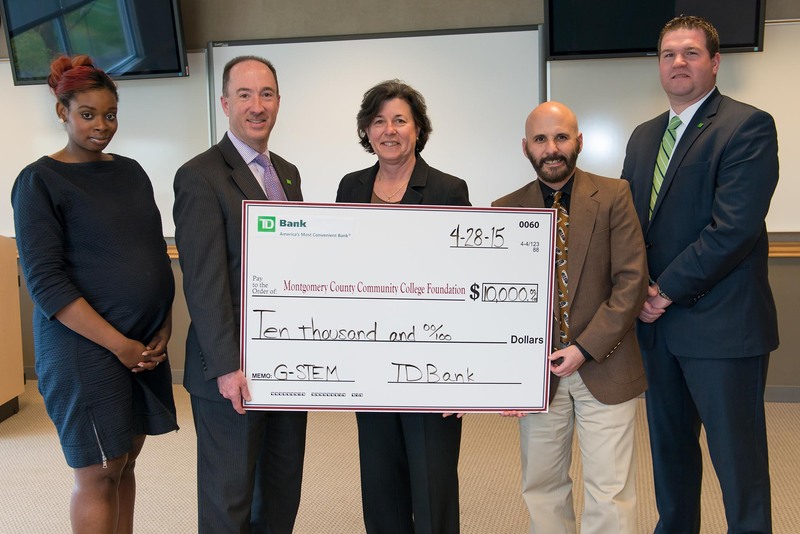 The TD Charitable Foundation, the charitable giving arm of TD Bank, America’s Most Convenient Bank®, recently donated $10,000 to Montgomery County Community College in support of its G-STEM (Green Science, Technology, Engineering and Math) summer program. From left, Dominique Goss, VP, Community Relations Manager, TD Foundation; Geoffrey Brandon, SVP, Regional Vice President, TD Bank; Dr. Karen A. Stout, President of Montgomery County Community College; Dr. David DiMattio, MCCC’s Dean of STEM; and David Rink, TD Bank Store Manager, Whitpain Store. Pottstown, Pa.—The TD Charitable Foundation, the charitable giving arm of TD Bank, America’s Most Convenient Bank®, recently donated $10,000, as part of the foundation’s commitment to giving back to the community, to Montgomery County Community College in support of its G-STEM (Green Science, Technology, Engineering and Math) summer program. MCCC launched the G-STEM program in 2011 as the result of an initial $10,000 grant received from the TD Charitable Foundation. 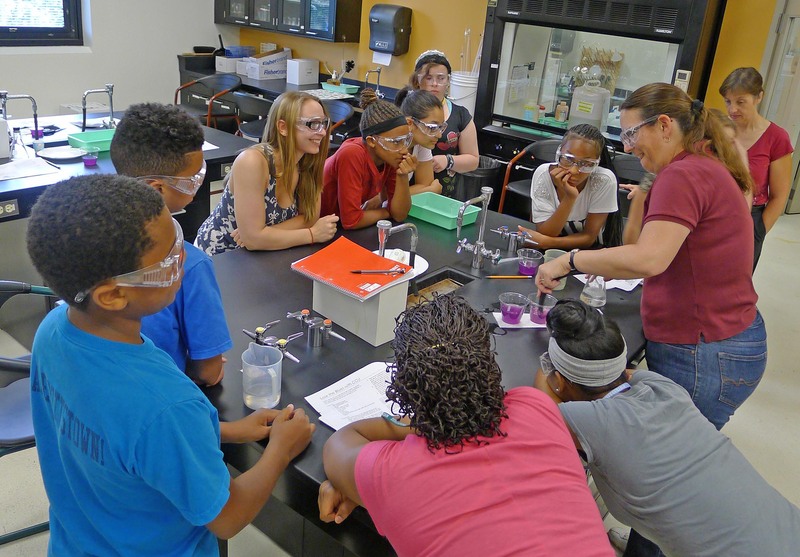 Since its inception, approximately 70 middle school students have attended the science program taught at the MCCC’s West Campus in Pottstown. Because of the ongoing generous support of the TD Charitable Foundation, MCCC can offer this program again for the fifth consecutive year. 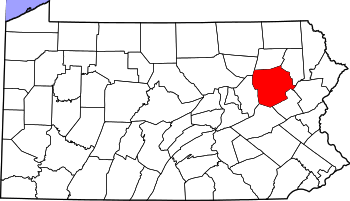 For 2015, the G-STEM program will be expanded to include 25 students in middle school through ninth grade from Norristown, as well as the Pottstown region at no cost to the participants. 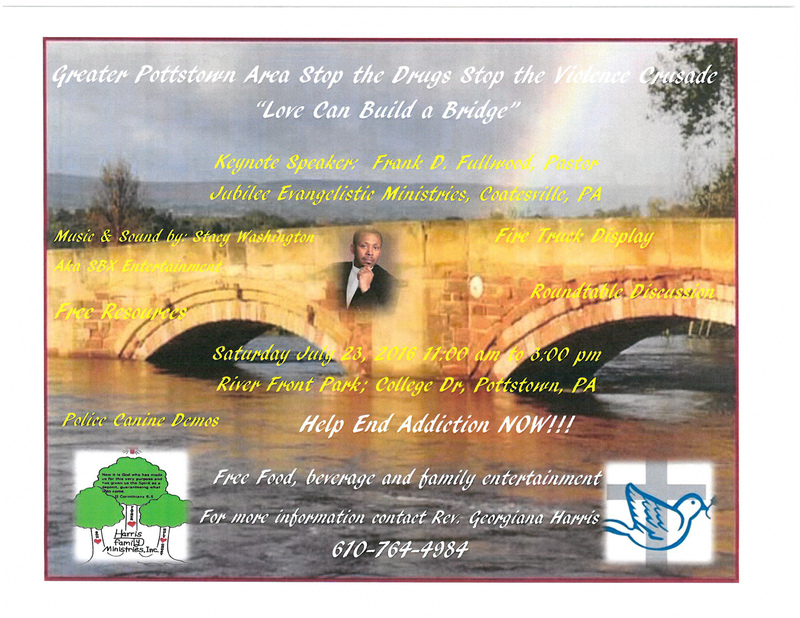 The program will be held at West Campus in Pottstown June 25, 26, 29, 30 and July 1, from 9 a.m. to 3 p.m., Monday through Thursday, and from 11 a.m. to 6 p.m. on Friday with a scientific presentation of work and award ceremony on the last day. 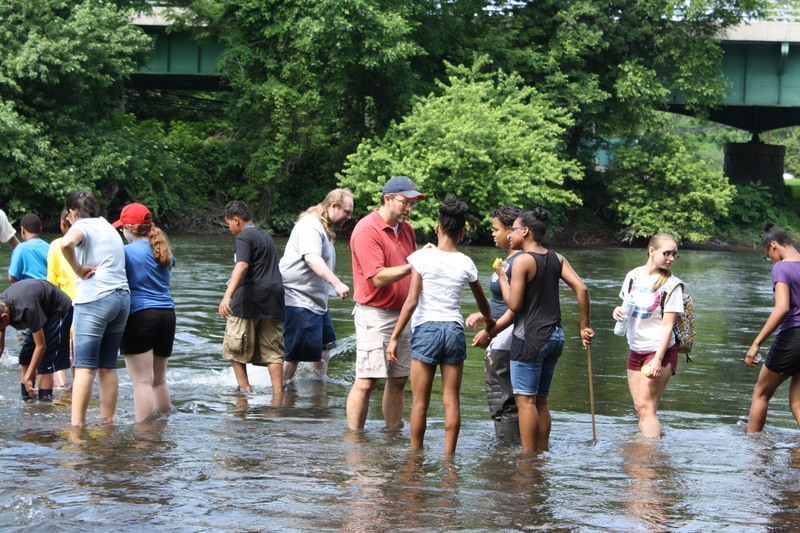 “Thanks to the TD Charitable Foundation’s ongoing, generous commitment, students will have the opportunity to learn the basic concepts of scientific methodology and data analysis through hands-on activities and will leave camp with a thorough understanding how the scientific process works, specifically as applied to environmental issues and stewardship,” said Dr. David DiMattio, MCCC’s Dean of STEM. Scenes from the Green Science, Technology, Engineering and Mathematics program in 2014 held at Montgomery County Community College’s West Campus in Pottstown. The program’s goals are to improve students’ understanding of science and the environment and to help prepare students for the academic rigor of their high school science curriculum. The program will help a diverse population of underserved students in the Pottstown and Norristown areas. MCCC offers nationally recognized, competitive STEM transfer programs, in addition to career-track and certification programs. Students receive an affordable, high-caliber education that enables them to reach their goals, including seamless transfer into one of the College’s many partner institutions or entry into the workforce. For more information about the College’s STEM programs, visit http://www.mc3.edu. The TD Charitable Foundation is the charitable giving arm of TD Bank N.A., which operates as TD Bank, America’s Most Convenient Bank®, and is one of the 10 largest commercial banking organizations in the United States. The Foundation’s mission is to serve the individuals, families and businesses in all the communities where TD Bank operates, having made more than $135.8 million in charitable donations since its inception in 2002. The Foundation’s areas of focus are affordable housing, financial literacy and education, and the environment. More information on the TD Charitable Foundation, including an online grant application, is available at www.TDBank.com. Southwestern Pennsylvania has low unemployment, a plethora of high school and college graduates and relatively safe streets, but residents are more likely to smoke cigarettes and be overweight compared to a group other major U.S. metro areas, according to a University of Pittsburgh report released Wednesday. The “2015 Pittsburgh Today & Tomorrow Report” from Pitt’s University Center for Social and Urban Research compared 11 quality-of-life factors in Southwestern Pennsylvania to 14 other metro areas. 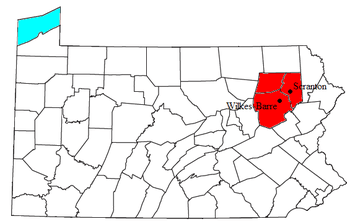 Perhaps the Wilkes-Barre metro area parties too much. 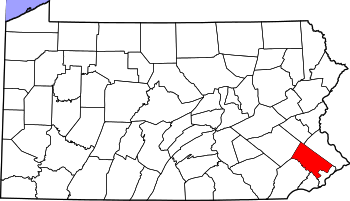 The Scranton/Wilkes-Barre area ranked as the fourth-most indulgent metro in the United States by the personal finance website badcredit.org. The website used data from the Center for Disease Control and Prevention and credit information from Experian, a credit reporting bureau, to analyze how indulgent residents are in 105 metro areas. ■ 7.8 percent of residents claiming to be heavy drinkers. ■ 21.5 percent who say they smoke everyday. ■ An obesity rate of 31.9 percent. ■ $28,974 in average consumer debt. When Philadelphia’s murder total fell to a historic low in 2013, officials believed it was no fluke. Now, with 2014 at the same rate – and other violence also down – experts say the city is indeed getting safer. With 248 slain, the toll is one above last year’s – and a 25 percent drop from 2012. But statistics show police in 2014 solved fewer killings than in 2013. Overall, violent crime fell 7 percent. 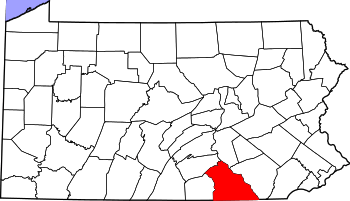 It was grim news Tuesday as a flurry of reports showed that Luzerne County’s middle class is shrinking while the wealthiest get richer with nearly one third of children under 18 live in poverty. Data show while the unemployment rate has dropped substantially both nationally and locally, the poverty rate has not seen a corresponding drop. If there was a silver lining in the data put out by three different sources, it may be that Luzerne and Lackawanna counties have lower rates of uninsured children than the state. Pennsylvania Partnerships for Children — which bills itself as a nonprofit and non-partisan child advocacy group — issued its annual “State of Children’s Health Care” report, which showed that the percentage of children lacking health insurance statewide dipped slightly since last year’s report, from 5.3 percent to 5.2 percent. NORRISTOWN — An urban planning class presented the results of a study of food availability in Norristown to council Tuesday that included targeted recommendations. Of Norristown’s 34,324 residents, 19.3 live below the poverty line, according to recent demographics. 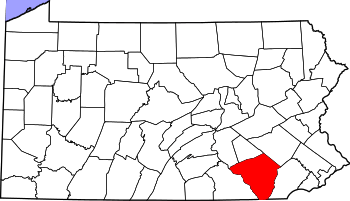 In addition, 2,484 of Norristown’s 13,058 households receive federal food assistance through SNAP (Supplemental Nutrition Assistance Program). A resident group helped the students shape the food study during a task force meeting in January, Krouchick said. 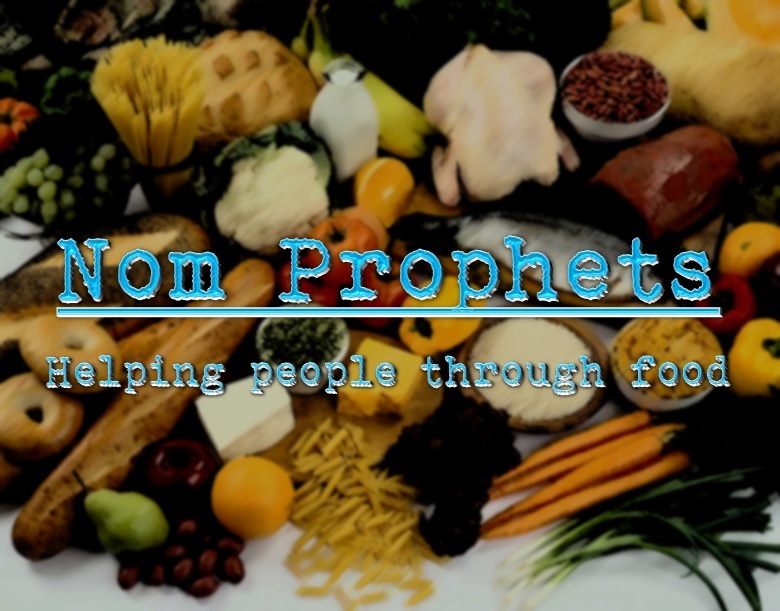 A community workshop was held in April allowing residents to explain what food issues were important to them. Blue Bell, Pa.— Montgomery County Community College student and community leader Ryan Bergman, Collegeville, is among an elite group of students in the country to earn the 2014 Newman Civic Fellow Award from Campus Compact. The Newman Civic Fellows Award honors college student leaders nationwide who inspire others and have worked to find solutions for challenges facing the community. According to the organization’s website, through service, research, and advocacy, Newman Civic Fellows are making the most of their college experiences to better understand themselves, the root causes of social issues, and effective mechanisms for creating lasting change. A Social Sciences major concentrating in Psychology, Bergman dedicates his service efforts to eradicating poverty and homelessness both on local and national levels. Selected as a Scholar for Community Service at MCCC for the 2013-14 academic year, Bergman used the opportunity to strengthen the College’s relationship with the Montgomery County chapter of Habitat for Humanity and Habitat ReStore. “Ryan’s commitment and dedication to issues of homelessness and poverty have assisted in raising student awareness about Habitat for Humanity and ways to individually support the work being done within the County,” shared MCCC President Dr. Karen A. Stout in her letter of recommendation to Campus Compact. Bergman chartered and serves as president of MCCC’s Habitat Club, whose members support ongoing volunteer dates at Habitat build-sites throughout the year. He also served as co-leader at the Habitat ReStore site in January during a college-wide day of service and again in March during spring break. “Our goal for this new club is to show the importance of improving our community and lending a helping hand whenever needed,” explained Bergman. In addition to his work locally, Bergman is a two-time participant in MCCC’s Alternative Spring Break program. In 2013, he traveled with students to West Virginia to build houses with Habitat for Humanity’s Collegiate Challenge, and in 2014, they volunteered at The Samaritan Woman in Baltimore, Md., a transitional residence program for victims of human trafficking. An electrician by trade, it was Bergman’s job that first brought him to MCCC when his company was contracted to do electrical work on the College’s new Children’s Center. While working on the Center, Bergman began to fall out of love with his career choice, especially as he noticed students around his age walking to and from class. “They all seemed full of life and motivated,” he shared. When the company for which he was working closed two years later, Bergman enrolled in College’s Engineering Technology program, but soon switched to Social Sciences. He also got heavily involved in service work through the College’s Office of Student Leadership & Involvement, where he is a work-study student. “I juggle my busy life by optimizing every moment of time; time management is crucial to excel at the college level,” he shared, adding that the work-study position enables him to “know the current happenings around campus” and participate as much as possible. Adding to his full schedule, Bergman is also president of MCCC’s Psychology Club, performs contracting and electrical work off campus, and still finds time for basketball and weight training, as well as for saltwater fishing, longboarding and hiking. After he graduates from MCCC, Bergman plans to continue his education in Clinical Psychology, knowing that the College prepared him for the next chapter in his life. Newman Civic Fellows are recommended by college and university presidents to acknowledge motivation and ability in public leadership. Newman Civic Fellows awards are made in memory of Frank Newman, who dedicated his life to creating systemic change through education reform.